Trophies2Go Wins the ARA 2015 Website of the Year! This entry was posted on February 6, 2015 by Jessica Anderson. 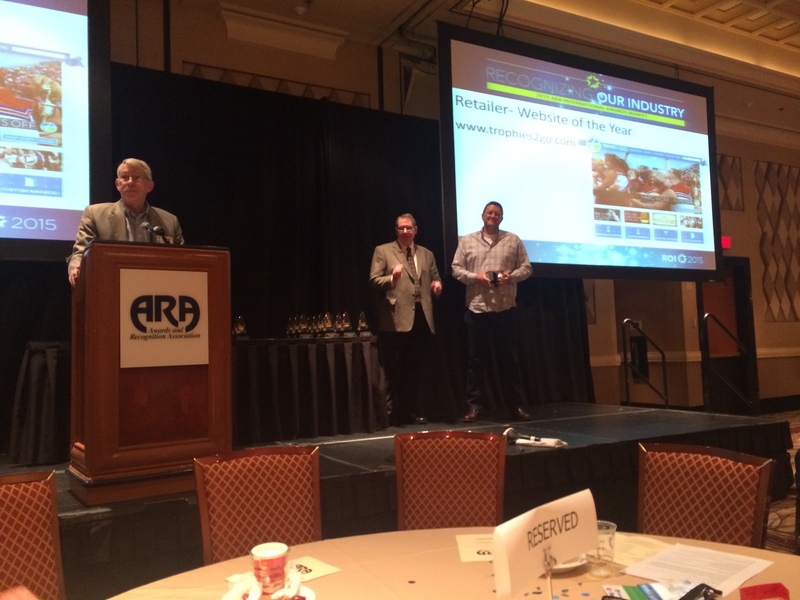 Jeff on stage accepting the 2015 Best Retailer Web Site Award in Las Vegas. We are pleased to announce our award for '2015 Best Retailer Web Site" from the Awards and Recognition Association (ARA) a week ago in Las Vegas. After a year of planning and building, our new website launched in October of 2014. Through the struggles of learning and using a new system, this new platform improves our customers' experience with better product photographs and a faster one page checkout. We couldn't have created our web site without the hard work and commitment of our developer, David Ward of Meticulosity.com. Dave helped up plan from the beginning and he, along with his team, created a state-of-the-art, world class website, now officially THE BEST in the awards industry! 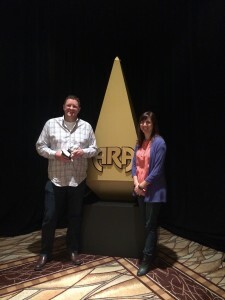 Jeff and I with our new award! Thank you to our staff for being flexible with the changes, bearing with all of the bugs, and for helping our customers navigate through the new system. Thank you customers for your support and understanding through our transition. Finally, thank you ARA for the award! We appreciate the recognition!